Actually, coffee comes first. But not any old coffee. It has to be fair trade organic Ethiopian coffee. Two reasons. It’s great coffee. But also, we’re on our annual summer holiday with unsung heroes, Glenyys and Graham Romanes. What that has to do with this special coffee will gradually unfold. Our summer holiday twenty-nine years ago was particularly memorable. We’d been out fishing with the kids and on the way back to the house we heard on the radio news that the Golden Venture had been seized and its cargo impounded. That was devastating news. Our holiday came at the end of a year of some intense fundraising with Community Aid Abroad (now known as Oxfam Australia). 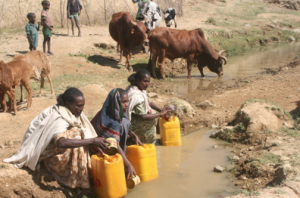 The combination of drought and war in Ethiopia had taken a terrible toll, and a major water project was planned. A drilling rig was part of the precious cargo that was to be supplied to the Relief Society of Tigray in northern Ethiopia. Graham tells the story beautifully in this special excerpt from Oxfam Australia’s 60th Anniversary video timeline. Whilst the loss of the drilling rig was tragic at the time – and a huge disappointment for Graham who had entered Tigray from Sudan in the north on foot to await the arrival of the rig – it led to a re-think of the all-important water program, and it was redesigned as a hand-dug wells program, a program that continues with great success three decades later. 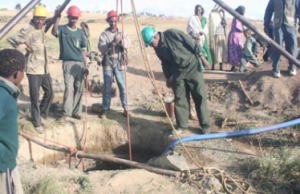 Over a hundred water technicians are now actively working in Tigray, helping local communities construct wells that guarantee a clean water supply for people who have previously had to walk kilometres to collect polluted water from streams and waterholes. Over three thousand wells have been built. Many Australian families continue to fund the hand-dug wells program through donations to WellWishers Australia, a small voluntary organisation. Some have given $6,000 -the amount needed for constructing a well for a village – as a living memorial to a loved one. Since 1997 Graham has served as Ethiopia’s Honorary Consul-General to Australia. As part of his ongoing commitment to encouraging trade between Australia and Ethiopia, Graham has been selling quality African products, in particular our much-loved coffee. Graham’s Fairtrade and Certified Organic coffee is sourced directly from Ethiopia, where the first coffee bush was discovered more than a thousand years ago. 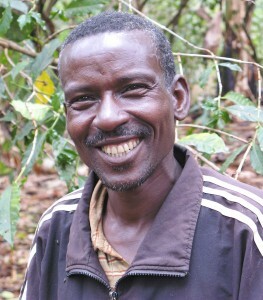 The coffee beans are supplied by the farmers of the Oromia Coffee Farmers Cooperative Union, which buys beans from the growers in the cooperative to sell directly to overseas buyers. Seventy per-cent of net profit is returned to the farmers, and the extra Fairtrade premium paid when we buy this coffee goes back to the cooperative for community projects. 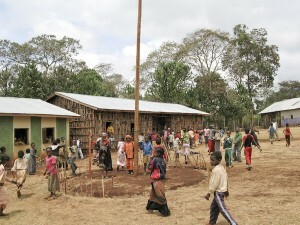 In 2005, Kalenso Makeniso in southern Ethiopia opened its first primary school which now has an enrolment of 900 students. By 2010 a second primary school and a secondary school were built, and now fair trade coffee has financed additional classrooms and health care centres. So we drink our morning holiday coffee with Glenyys and Graham, gratefully recalling Graham’s many stories of encounters with generous Ethiopian villagers who’ve been eager to share a meal with “Mr Grum”, no matter how little food was left in the village. You can be part of the fair trade organic Ethiopian coffee story too, ordering coffee for home from the New Internationalist Australia shop, or bulk supplies for catering direct from Graham. Every cup counts. This entry was posted in Activism, Education, Environment, Fair trade, Foreign aid and development and tagged activism, coffee, Community Aid Abroad, education, employment, environment, Ethiopia, Ethiopian coffee, fair trade, Graham Romanes, Oxfam, Oxfam Australia, WellWishers Australia by Brian Loffler. Bookmark the permalink.